Car Seat Signs by Cold Snap Studio: New Moms: Wash Your Hands and Do Not Touch Baby Signs Belong in your Hospital Bag! 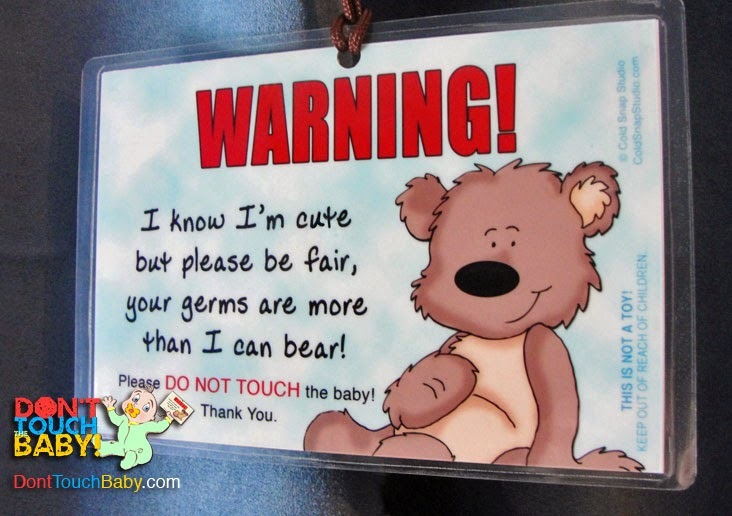 Wash Your Hands Baby Car Seat Signs should be in your hospital bag! You know, I laugh when I hear people say that putting up a Wash Your Hands Sign is "silly" and that germs are "good" for newborn immune systems. I can assure you, whoever says these things never walked into a hospital nursery—at least, not in this day and age—or simply doesn't remember what they make you do the instant you get there, before having any contact with your own baby! When my daughters were born, my husband and I would, of course, visit the nursery often. And the first thing they make you do is wash your hands — and I mean wash them, practically scraping the top layer of skin off under hot water, with sterilized soap, for a full 60 seconds (our hospital had a timer). And, may I add, my daughters were not premies, they were born healthy! Newborns and germs DON'T mix. They are very fragile, they can't regulate their body temperature well, and getting sick and/or a fever while so small is extremely serious! I am not saying this to merely sell you something — this is a fact! The minute we left the hopital and went out in public (I had to buy a few things I hadn't anticipated on), people tried to touch! "How cute!!! How old is she?" They'd reach for her and they'd play 20 questions. The questions were fine; but the touching really bothered me, especially since I'm not the confrontational type. I've seen some people attach hand sanitizer to car seats ... well, try to get away with only applying hand sanitizer in a hospital nursery ... they'll laugh you out of the room! The fact of the matter is, people should NOT be touching your baby! You don't know where their hands have been, and face it — you're not going to ask! YOU NEED A BABY SIGN! A car seat sign should be on your packing list for the hospital. You absolutely have to have it! Because people love newborns, they have the misconception that germs are "good" for your newborn or preemie (or maybe they just don't think about it), and they like to touch, often without even asking or before you can say no. If you haven't had this problem, consider yourself blessed — and don't count on it never happening! Here's a helpful hint: If you visit our website through WashYourHandsSigns.com, you can get a 5% bonus coupon for purchase of our Wash Your Hands signs! This coupon may be combined with most other discounts, so keep it handy and feel free to share! 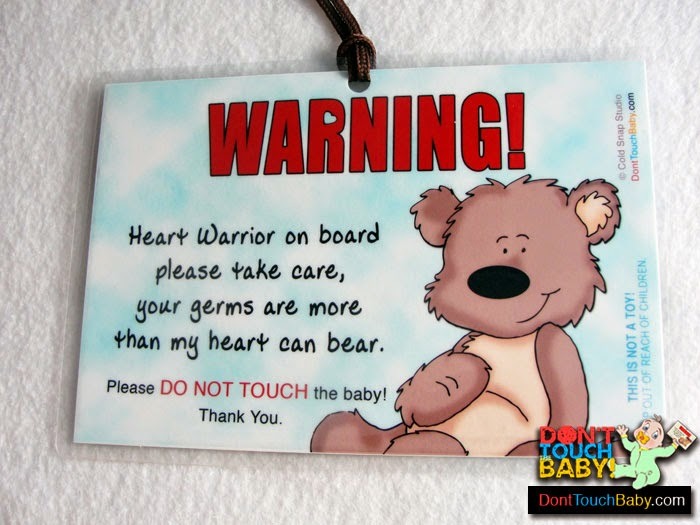 You can also purchase a matching Teddy Bear Do Not Touch the Baby Car Seat Sign and CHD Heart Warrior Wash Your Hands Signs on our website, DontTouchBaby.com.